Pope Gregory XIII (Latin: Gregorius XIII; 7 January 1502 – 10 April 1585), born Ugo Boncompagni, was Pope of the Catholic Church from 13 May 1572 to his death in 1585. He is best known for commissioning and being the namesake for the Gregorian calendar, which remains the internationally accepted civil calendar to this day. Ugo Boncompagni was born the son of Cristoforo Boncompagni (10 July 1470 – 1546) and of his wife Angela Marescalchi in Bologna, where he studied law and graduated in 1530. He later taught jurisprudence for some years, and his students included notable figures such as Cardinals Alexander Farnese, Reginald Pole and Charles Borromeo. He had an illegitimate son after an affair with Maddalena Fulchini, Giacomo Boncompagni, but before he took holy orders. At the age of thirty-six he was summoned to Rome by Pope Paul III (1534–1549), under whom he held successive appointments as first judge of the capital, abbreviator, and vice-chancellor of the Campagna e Marittima. Pope Paul IV (1555–1559) attached him as datarius to the suite of Cardinal Carlo Carafa, Pope Pius IV (1559–1565) made him Cardinal-Priest of San Sisto Vecchio and sent him to the Council of Trent. He also served as a legate to Philip II of Spain (1556–1598), being sent by the Pope to investigate the Cardinal of Toledo. It was there that he formed a lasting and close relationship with the Spanish King, which was to become very important in his foreign policy as Pope. Upon the death of Pope Pius V (1566–1572), the conclave chose Cardinal Boncompagni, who assumed the name of Gregory XIII in homage to the great reforming Pope, Gregory I (590–604), surnamed the Great. It was a very brief conclave, lasting less than 24 hours. Many historians have attributed this to the influence and backing of the Spanish King. 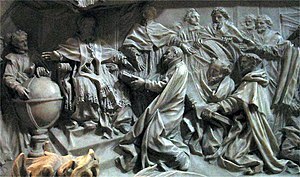 Cardinal Borromeo and the cardinals wishing reform accepted Boncompagni's candidature and so supported him in the conclave while the Spanish faction also deemed him acceptable due to his success as a nuncio in Spain. Gregory XIII's character seemed to be perfect for the needs of the church at the time. Unlike some of his predecessors, he was to lead a faultless personal life, becoming a model for his simplicity of life. Additionally, his legal brilliance and management abilities meant that he was able to respond and deal with major problems quickly and decisively, although not always successfully. Once in the chair of Saint Peter, Gregory XIII's rather worldly concerns became secondary and he dedicated himself to reform of the Catholic Church. He committed himself to putting into practice the recommendations of the Council of Trent. He allowed no exceptions for cardinals to the rule that bishops must take up residence in their sees, and designated a committee to update the Index of Forbidden Books. He was the patron of a new and greatly improved edition of the Corpus juris canonici. In a time of considerable centralisation of power, Gregory XIII abolished the Cardinals Consistories, replacing them with Colleges, and appointing specific tasks for these colleges to work on. He was renowned for having a fierce independence; some confidants noted that he neither welcomed interventions nor sought advice. The power of the papacy increased under him, whereas the influence and power of the cardinals substantially decreased. Also noteworthy is his establishment of the Discalced Carmelites, an offshoot of the Carmelite Order, as a distinct unit or "province" within the former by the decree "Pia consideratione" dated 22 June 1580, ending a period of great difficulty between them and enabling the former to become a significant religious order in the Catholic Church. A central part of the strategy of Gregory XIII's reform was to apply the recommendations of Trent. He was a liberal patron of the recently formed Society of Jesus throughout Europe, for which he founded many new colleges. The Roman College of the Jesuits grew substantially under his patronage, and became the most important centre of learning in Europe for a time. It is now named the Pontifical Gregorian University. Pope Gregory XIII also founded numerous seminaries for training priests, beginning with the German College at Rome, and put them in the charge of the Jesuits. In 1575 he gave official status to the Congregation of the Oratory, a community of priests without vows, dedicated to prayer and preaching (founded by Saint Philip Neri). In 1580 he commissioned artists, including Ignazio Danti, to complete works to decorate the Vatican and commissioned The Gallery of Maps. Also noteworthy during his pontificate as a further means of putting into practice the recommendations of the Council of Trent is the transformation in 1580 of the Dominican studium founded in the 13th century at Rome into the College of St. Thomas, the precursor of the Pontifical University of St. Thomas Aquinas, Angelicum. Pope Gregory XIII is best known for his commissioning of the calendar after being initially authored by the doctor/astronomer Aloysius Lilius and with the aid of Jesuit priest/astronomer Christopher Clavius who made the final modifications. The reason for the reform was that the average length of the year in the Julian calendar was too long – as it treated each year as 365 days, 6 hours in length, whereas calculations showed that the actual mean length of a year is slightly less (365 days, 5 hours and 49 minutes) As a result, the date of the actual vernal equinox had slowly (over the course of 13 centuries) slipped to 10 March, while the computus (calculation) of the date of Easter still followed the traditional date of 21 March. This was verified by the observations of Clavius, and the new calendar was instituted when Gregory decreed, by the papal bull Inter gravissimas of 24 February 1582, that the day after Thursday, 4 October 1582 would be not Friday, 5 October, but Friday, 15 October 1582. The new calendar duly replaced the Julian calendar, in use since 45 BC, and has since come into universal use. Because of Gregory's involvement, the reformed Julian calendar came to be known as the Gregorian calendar. The switchover was bitterly opposed by much of the populace, who feared it was an attempt by landlords to cheat them out of a week and a half's rent. However, the Catholic countries of Spain, Portugal, Poland, and Italy complied. France, some states of the Dutch Republic and various Catholic states in Germany and Switzerland (both countries were religiously split) followed suit within a year or two, and Hungary followed in 1587. However, more than a century passed before Protestant Europe accepted the new calendar. Denmark, the remaining states of the Dutch Republic, and the Protestant states of the Holy Roman Empire and Switzerland adopted the Gregorian reform in 1700–01. By this time, the calendar trailed the seasons by 11 days. Great Britain and its American colonies reformed in 1752, where Wednesday, 2 September 1752 was immediately followed by Thursday, 14 September 1752; they were joined by the last Protestant holdout, Sweden, on 1 March 1753. The Gregorian calendar was not accepted in eastern Christendom for several hundred years, and then only as the civil calendar. Though he expressed the conventional fears of the danger from the Turks, Gregory XIII's attentions were more consistently directed to the dangers from the Protestants. He also encouraged the plans of Philip II to dethrone Elizabeth I of England (reigned from 1558–1603), thus helping to develop an atmosphere of subversion and imminent danger among English Protestants, who looked on any Catholic as a potential traitor. In 1578, to further the plans of exiled English and Irish Catholics such as Nicholas Sanders, William Allen, and James Fitzmaurice FitzGerald, Gregory outfitted adventurer Thomas Stukeley with a ship and an army of 800 men to land in Ireland to aid the Catholics against the Protestant plantations. To his dismay, Stukeley joined his forces with those of King Sebastian of Portugal against Emperor Abdul Malik of Morocco instead. Another papal expedition sailed to Ireland in 1579 with a mere 50 soldiers under the command of Fitzmaurice, accompanied by Sanders as papal legate. All of the soldiers and sailors on board, as well as the women and children who accompanied them, were beheaded or hanged on landing in Kerry, in the Smerwick Massacre. Gregory's greatest success came in his patronage of colleges and seminaries which he founded on the Continent for the Irish and English, among others. In 1580 he was persuaded by English Jesuits to moderate or suspend the Bull Regnans in Excelsis (1570) which had excommunicated Queen Elizabeth I of England. Catholics were advised to obey the queen outwardly in all civil matters, until such time as a suitable opportunity presented itself for her overthrow. Pope Gregory XIII had no connection with the plot of Henry, Duke of Guise, and his brother, Charles, Duke of Mayenne, to assassinate Elizabeth I in 1582. After the St. Bartholomew's Day Massacres of Huguenots in France in 1572, Pope Gregory celebrated a Te Deum mass. However, some hold that he was ignorant of the nature of the plot at the time, having been told the Huguenots had tried to take over the government but failed. Three frescoes in the Sala Regia hall of the Vatican depicting the events were painted by Giorgio Vasari, and a commemorative medal was issued with Gregory's portrait and on the obverse a chastising angel, sword in hand and the legend UGONOTTORUM STRAGES ("Overthrow of the Huguenots"). In Rome Gregory XIII built the magnificent Gregorian chapel in the Basilica of St. Peter, and extended the Quirinal Palace in 1580. He also turned the Baths of Diocletian into a granary in 1575. He appointed his illegitimate son Giacomo,[a] born to his mistress at Bologna before his papacy, castellan of Sant'Angelo and Gonfalonier of the Church; Venice, anxious to please, enrolled him among its nobles. Philip II of Spain appointed him general in his army. Gregory also helped his son to become a powerful feudatary through the acquisition of the Duchy of Sora, on the border between the Papal States and the Kingdom of Naples. In order to raise funds for these and similar objects, he confiscated a large proportion of the houses and properties throughout the states of the Church. This measure enriched his treasury for a time, but alienated a great body of the nobility and gentry, revived old factions, and created new ones. The pope canonized four saints during his pontificate and in 1584 beatified his predecessor Pope Gregory VII. During his pontificate, the pope created 34 cardinals in eight consistories; this included naming his nephew Filippo Boncompagni to the cardinalate in the pope's first consistory in 1572. Gregory XIII also named four of his successors as cardinals all in 1583: Giovanni Battista Castagna (Urban VII), Niccolò Sfondrati (Gregory XIV), Giovanni Antonio Facchinetti (Innocent IX), and Alessandro de' Medici (Leo XI). The pope suffered from a fever on 5 April 1585 and on 7 April said his usual private Mass still in ill health. The pope seemed to recover enough that he was able to conduct meetings throughout 8-9 April though it was observed he did not feel well. But a sudden change on 10 April saw the pope confined to bed and was noticed to have had a cold sweat and weak pulse; Gregory XIII himself received the Extreme Unction moments before he died. ^ Ugo Boncompagni had Giacomo legitimated on 5 July 1548 by the bishop of Feltre. ^ "The Cardinals of the Holy Roman Church: Ugo Boncompagni". Fiu.edu. 3 December 2007. Retrieved 23 June 2013. ^ Tazón, Juan E. (2003). The Life and Times of Thomas Stukeley (c.1525-78). Aldershot, United Kingdom: Ashgate. pp. 222–235. ISBN 9780754632856. ^ Schaff, Philip (1910). History of the Christian Church, Volume VII. Modern Christianity. The German Reformation. New York: Charles Scribner's Sons. Note 53. ^ "Sede Vacante 1585". 18 March 2016. Retrieved 21 January 2019. Initial text from the 9th edition (1880) of an unnamed encyclopedia. This article incorporates text from a publication now in the public domain: Herbermann, Charles, ed. (1913). "Pope Gregory XIII" . Catholic Encyclopedia. New York: Robert Appleton. Wikimedia Commons has media related to Pope Gregory XIII.